Kesha Bowers is not your average parent. 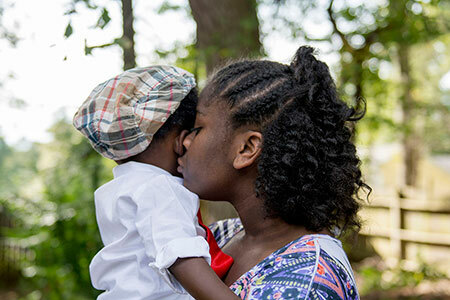 A single mother holding a full-time job, in the past year she also has fostered seven children in need of a safe, nurturing temporary home; adopted one of those foster children; and is in the process of adopting another born with fetal alcohol syndrome. To say her household is organized would be an understatement. Kendrick Bowers was adopted in August 2014. The Children’s Home has celebrated eight adoptions of foster children so far in 2014. Next to a wall covered with pictures of smiling children, Kesha gently straightens the tie on two-year-old Kendrick, whom she adopted in August, and then picks up his tiny foster sibling, a softly fussing two-month-old girl. Kesha is assisted in parenting duties by her own mother, who lives with her and also fosters children. Kesha has felt called to help children ever since she was one herself. The number of children in Georgia’s foster care system went from 7,500 to 9,500 in the past year alone after several changes to the child welfare system vastly increased the reports of abuse and neglect being investigated. Kesha’s adopted daughter Destiny kisses her younger brother, Kendrick. The sudden increase of foster care children has put a strain on agencies such as The Children’s Home, which currently must turn away an average of 30 children in need of a temporary home every week because of a lack of foster families. There are moments of frustration for Kesha as well. She recalls when her five-year-old foster daughter destroyed a room and watched to see how she would react. The Children’s Home supports each foster parent’s individual needs so they can better provide care for the children, and so they ideally want to continue to foster. That means accommodating requests for respite as much as possible, visiting foster homes at least twice a month, attending all court dates, being available by phone around the clock, and even taking a child to a doctor’s appointment if the foster parent is unable to do so. The Home also provides a strong support network to foster parents while helping birth parents deal with whatever issues led to the foster placement. The goal is to help children heal from the trauma they have experienced by establishing educational and therapeutic interventions, helping them develop coping skills, and most importantly, finding permanency either by returning to their birth family, an approved relative or through adoption. For two-year-old Kendrick, permanency means he now is Kesha’s son. 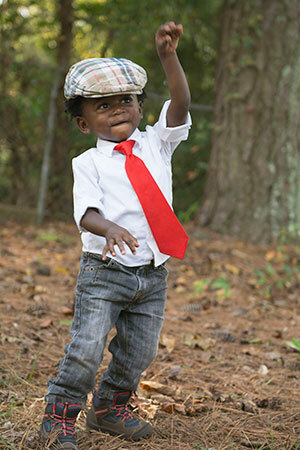 The toddler has several medical issues as a result of his former life, but he is happy – and thriving. This is obvious in his smile, in the way he engages with other children, and in the love that radiates between mother and son. 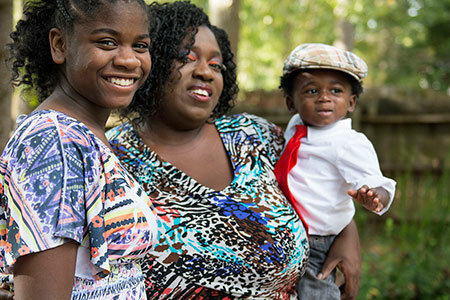 Kesha Bowers (center) with daughter Destiny and son Kendrick. The Children’s Home has served more than 200 foster care children and youth in 2014 through the Foster Care, Transitional and Independent Living programs, and the programs continue to help more youth for longer periods of time. The Children’s Home has provided more than 22,000 days of care to our foster children and youth this year, an increase of more than 46 percent from 2013. Help us recruit new foster parents. Spread the word to your friends and community that safe, nurturing foster families are needed. Consider becoming a foster parent. Homes are needed for a racially and ethnically diverse population of children and youth, and particularly for sibling groups of two children or more, teenagers, and medically fragile children of all ages. Most of the children will have developmental, emotional or educational delays. Attend one of our informational meetings to learn more. These orientation classes can be held at other settings, such as churches, or on an individual basis. IMPACT training, which is required for anyone wishing to foster or adopt through the State Foster Care System, is offered free in our Decatur and Gainesville offices. Learn more: Contact Denise Peacock in the Atlanta area; Contact Sondra Rogers in the Gainesville area.